Looking a little COCKEYED at this RUN OF THE MILL situation, I used the RULE OF THUMB and put my NOSE TO THE GRINDSTONE to ultimately feel FAIR TO MIDDLING. Huh? 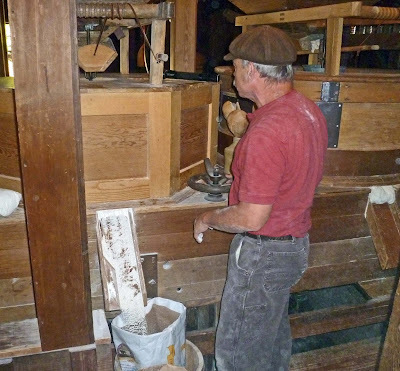 Did you know these sayings originated in the milling profession? We learned this on our tour of the historic “Bale Grist Mill’. 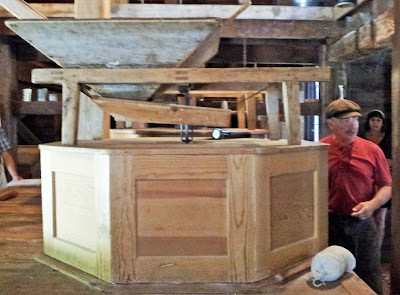 While watching PBS show 'California Gold' our hero Huell Howser shared his experienced at the Bale Grist Mill This adventure was added to our bucket list. The mill is part of the Napa County Regional Park District. It located in a scenic tree lined area next to a creek. The creek provides water power to turn the huge water wheel which in turn powers the grinding stones. Located on the scenic winery lined highway 29 just past St. Helena it is a quick turn-off the road to the mill. It is a short scenic walk from the parking lot to the mill. The mill is impressive. The water driven wheel is a good three stories tall. We walk into the mill and are greeted by a friendly docent. A nominal fee is paid and our tour begins. You will learn everything there is to know about milling. The mill was not only a place to have your grains milled but a social gathering place for the local populace. The actual working mill has been restored to its past glory. During the tour the guide put the mill into motion and demonstrated the actual milling process. Fresh milled grains are available for purchase. 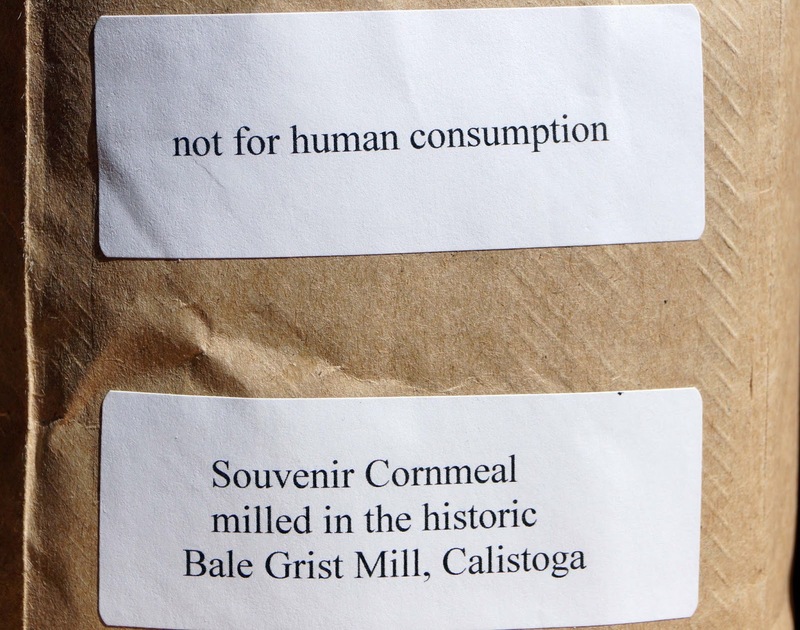 They are labeled “Not for Human Consumption” thanks to regulatory regulations. 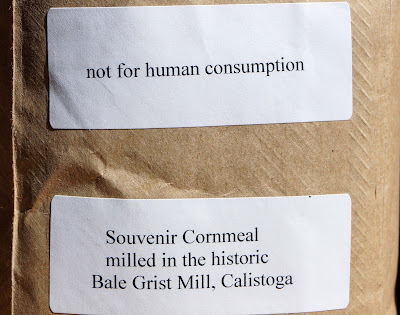 We witnessed the actual milling and felt no concern for this label. This process has been used for Century’s with out the help of regulators. These flours do not get any fresher. 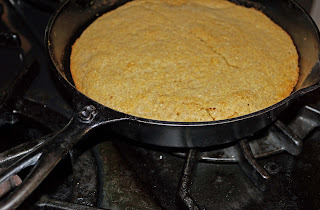 The whole wheat flour and cornmeal had wonderful textures and smells. Run of the Mill: This is whatever grain that is being processed at a particular time. Nose to the Grindstone: The miller had to keep constant watch by smell to make sure the grain was not being burned by the stones being to close. 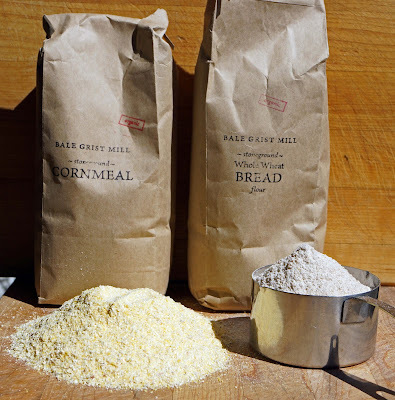 Fair to Middling: fair and middling were to different grades of flour. Once we were home we had to taste our souvenirs. 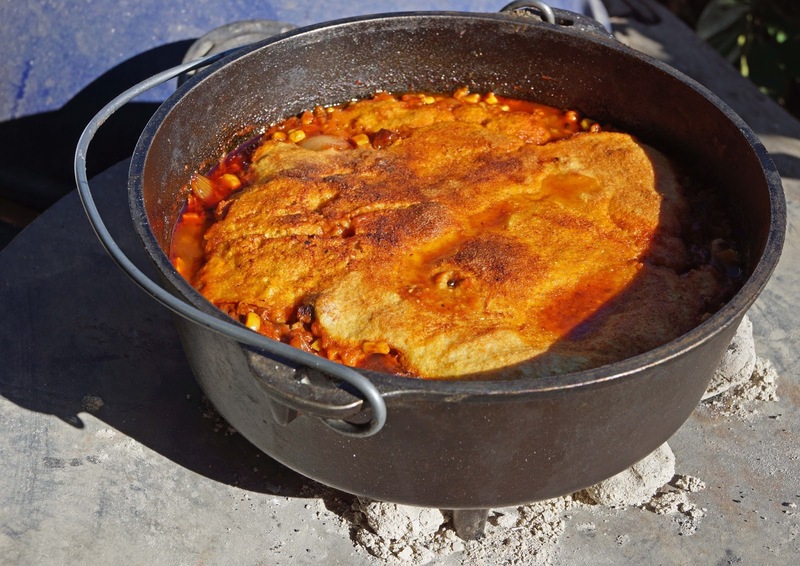 We cooked some corn bread and also made some tamale pie in a Dutch oven. Our corn meal and whole wheat flour freshly milled were a tasty treat. If you get a chance the Bale Grist Mill is a wonderful place to visit. You know Huell Howser is the ‘Rule of Thumb’ when is comes to California Gold. I must have passed that place 20 times and never stopped in. Next time, I will! Very interesting post! Zoomie, We have passed it numerous times too. It took our good friend Huell to show us the light. Wow! What a fun and educating post. I have never heard of the place. We are most certainly over regulated. I looked into opening a small hot dog cart and was amazed. That's fantastic. So cool to learn these milling terms. Greg, I deal with inspectors at the Farmers Market. The rules and regulations seem to change daily. cookiecrumb, History can be fun and tasty. Three Dogs BBQ, Come back tomorrow for the recipe.